According to leading oven manufacturers, cleaning the oven is of essential importance to the healthy condition of all family members. On top of that, regular oven maintenance is also linked with extended lifespan of the appliance. Thus, keeping your oven clean will not only be beneficiary for all family members, but also for the appliance itself. Knowing how expensive ovens are, we think that you should not miss any chance to extend the durability of your appliance. 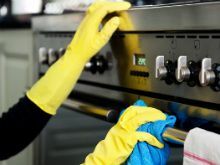 You clean your oven regularly, sacrificing hours and hours of your time in a desperate attempt to eliminate burnt on grease and grime from the walls and bottom of the oven. Yet, this is far from enough to keep the appliance in an utmost condition. Oven manufacturers say that there are areas inside the oven which a person lacking the equipment and knowledge necessary for a good oven cleaning can not reach when they clean their appliance. With years of experience in the field of oven cleaning, we at City Cleaners London offer you affordable oven cleaning services available for booking throughout the week and also on bank holidays as well. Choose us to clean your appliance and the results will amaze you. 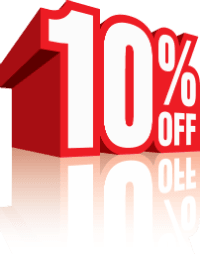 City Cleaners London are experienced and armed with highest quality cleaning products. Our services can be performed in London. Choose us and your oven will look like brand-new. Oven manufacturers advise homeowners to clean their oven once every 6 to 12 months, depending on how often they use it. This will keep the appliance sanitary and extend its durability, and it will also eliminate fire hazards from your property as well. Q: Who should I turn to if I have questions concerning the company? A: You can contact our friendly customer support team at your convenience. Our customer support team will answer all of your questions thoroughly. Q: Can I book you for short-notice cleaning services? A: Yes, City Cleaners London are available for short-notice services. Q: I don’t like being made to wait. How can I be sure that your technician will come on time? A: All of our technicians are familiar with London and we guarantee that they will come on time. Q: How much do I have to wait before I can use the oven after the cleaning session? A: You can use the appliance right after our technician has completed the cleaning job. Q: How long does the oven cleaning session take? A: The duration of the oven cleaning depends on the type and size of the oven, and of course, what condition it is in. usually, our oven cleaning session takes between 1-3 hours. Q: What is not included in the oven cleaning session? A: When we clean, we clean the entire oven, what is obvious to the eye and what is not. However, we would never risk to to do anything which can cause any damage to your oven. Q: Is there something I have to do before the oven cleaning? A: We clean the appliance when it is turned off and cold so we would ask you not to turn it on or use it before the appointment. Q: How often the oven should be professionally cleaned? A: Unfortunately, we cannot tell with certainty. The frequency really does depend on how often the appliance is used and what types of food are cooked in there. 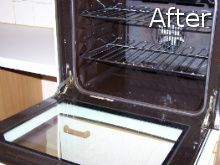 If the oven is used to cook greasy meals, you will need to have it deep cleaned on a more regular basis. 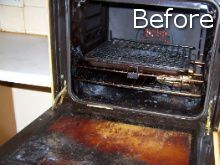 The majority of our customers use the oven cleaning twice a year. Q: Can you also clean self-cleaning ovens? A: All types of ovens are dirty and need to be cleaned. Thankfully, we, at our company, are able to deal with all types of ovens. The products we make use of are specially designed to cope with self-cleaning ovens, too. As many ovens are not able to reach a temperature high enough to burn off leftovers, the grease and fat can still be found in the oven. Our technician will deep clean the entire appliance for you. A: Each and every one of our oven technicians has been fully trained to a high standard. The training courses are the finest in the oven cleaning industry so you can therefore rest assured that your oven cleaning will be of a top quality and carried out by a properly trained expert.